The Minister of State for Universities and Science has visited Karm Research Group at the new wing at Liverpool Science Park recently. 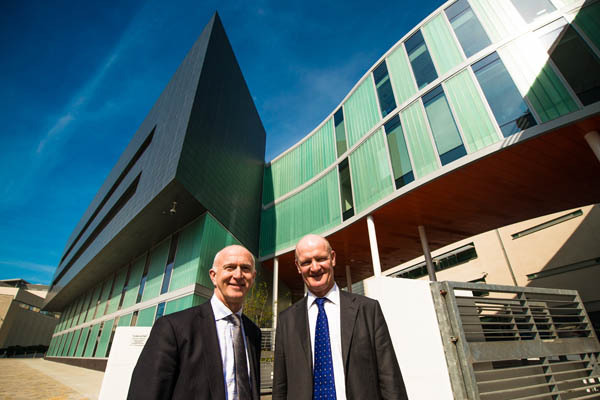 The Rt Hon David Willetts MP met with Liverpool Science Park board member and Vice-Chancellor of Liverpool John Moores University, Professor Nigel Weatherill and toured the new four-storey, 40,000 sq ft building. The structure connects to Innovation Centre 1 (ic1) on Mount Pleasant and has already welcomed a host of new tenants including Karm Research Group which is developing products in the chemistry sector and Contract Analytical Laboratories which provides pharmaceutical and biopharmaceutical development solutions. On the visit, Mr Willetts met with the technical director at Karm Research Group, Mark Jones who showed him around the new laboratory facilities and explained the technologies being worked on. These include an antimicrobial product for the healthcare industry and a revolutionary new type of gravure printing cylinder. Mr Willetts said: “It was fantastic to see the brand new purpose built office and commercial laboratory space at Liverpool Science Park and also to meet the talented businesses which have moved there. Karm Research Group is a research and development focused group of companies with active projects in the printing and packaging, electronics, healthcare and construction sectors. Powered by Edible SEO & Marketing © 2016 Karm Research Group. Company No. 08747407. Registered Office: Karm Research Group, Liverpool Science Park, 131 Mount Pleasant, Liverpool, Merseyside L3 5TF, UK	.